Are you familiar with Joe’s Special ? 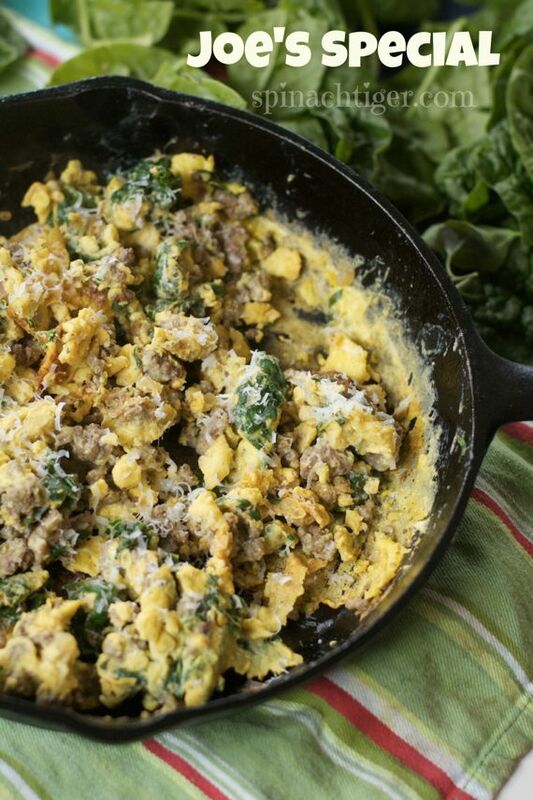 It’s a medley of ground beef, spinach and eggs, made famous in San Francisco at New Joe’s, an Italian restaurant in 20’s, and was later placed on the menu at a place called Original Joe’s. Eventually, it landed on many menus in California and even ventured out of state. Isn’t it interesting how recipes develop and migrate, and this was all before the internet? I first learned about this heavy protein, paleo friendly breakfast, brunch or dinner when I lived in Southern California. Lots of restaurants served it and everyone quite familiar with it, except me. I decided to bring you this recipe, as a week ago, a gigantic bag of spinach was placed on my doorstep. Things like that happen to me because I am Spinach Tiger, and I have friends in the right places. They know I make spinach smoothies quite often, but even I couldn’t finish off this bag of spinach before Thanksgiving. I remembered Joe’s special, which, while many recipes use frozen spinach, I think is much better with fresh. After I made a few green spinach and kale smoothies, and my Joe’s special in my cast iron pan, I still had this huge bag of spinach, and I didn’t want it going to waste. I’ve never had to think about freezing spinach or kale because we eat it up fast enough, but was to go on and discover something amazing. You would think that I know just about everything concerning spinach, but I needed google (don’t I always) to help me discover that spinach can be frozen, but there is a specific way to do it, with varying opinions. Some insist that spinach must be blanched and shocked before freezing, while others take the green super food directly to the freezer. I chose the latter, and was shocked at the results. I’m not sure what I expected, but this is what my spinach looked like when I took it out of the freezer. It looked exactly the same as the day I put it in, only it was frozen. 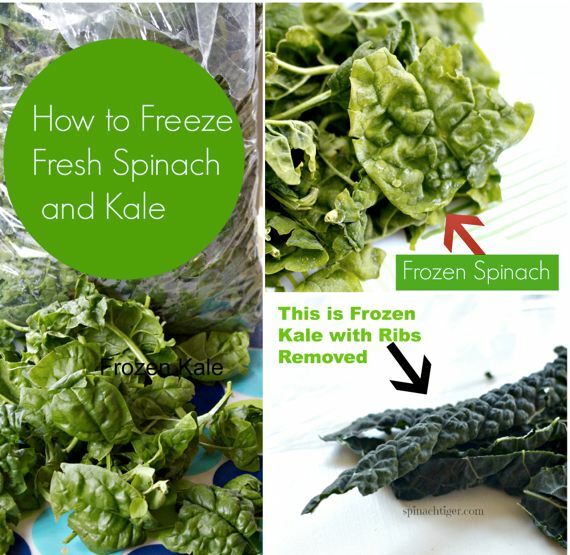 By the way, you can also freeze kale the exact same way. Another great culinary discovery! If you are getting it fresh from the dirt, triple wash it. Once frozen, it’s too late. Spin it dry with a salad spinner longer than you think you should. It has to be dry. Leave it out on towels for a few hours to really ensure it is dry. Wrap it in up gently in gallon size freezer bags. Don’t be concerned with quantities for future use. The spinach didn’t freeze into one cube and I was able to take only the amount out of the bag I wanted to for my recipe. This is not spinach for spinach salad, but it most certainly can be sauteed, made into a smoothie, spinach manicotti or your favorite spinach recipe. The kale is especially good put into soups. Joe’s special, a long time classic of ground beef, spinach and eggs is something I’m making a little more frequently, now that I have all that spinach. So tell me, have you ever had Joe’s Special and do you freeze your greens? Joe's special, a medley of ground beef, spinach and eggs, first made famous in San Fransciso. Saute onion until softened. Add in garlic and cook for one minute. Add in ground beef and stir fry with onion and garlic until cooked through. Add in salt, pepper, chili flakes and herbs. Add in big handfuls of spinach. If frozen using my method, just add in frozen at this point. Spinach will soften right way. Add in 4 beaten eggs. Continue to cook until eggs are done. This is how I make my eggs in the morning, except I use Tarantino breakfast sausage instead of ground beef ( this is the best breakfast sausage I’ve ever tasted and gives it a nice slight spicy element to the food. It also has a really nice seasoning in the sausage itself, and I don’t add any other spicies to it, including any additional salt or pepper and it comes out nicely seasoning). Occassionally I would add diced tomatoes to it if I’m in the mood for an acidic element. ENJOY!!! 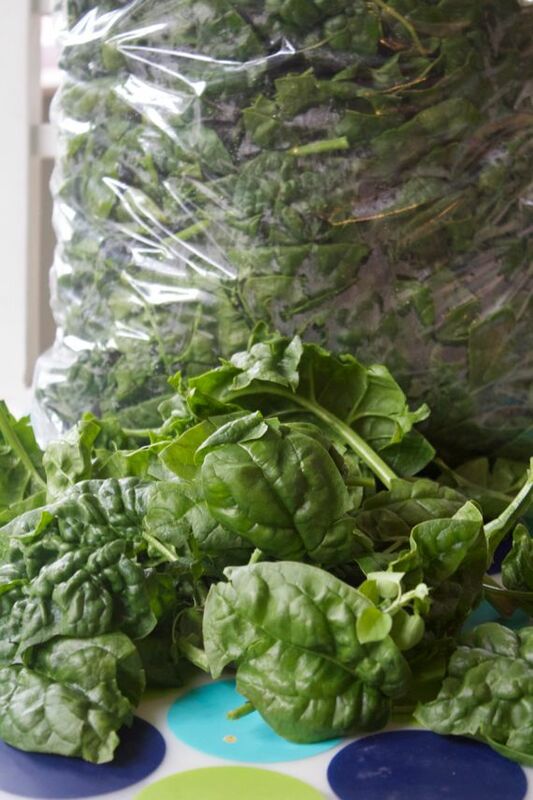 Great read btw, I buy the super big bags of spinach and mixed greens at Costco and they usually spoil before I can eat them all, but I’m going to start freezing them as soon as I buy them. Thanks for the post. Yes, I was very happy to learn that kale would freeze well since Whole Foods sells an ENORMOUS bag of already-prepared kale that makes my kale salads super easy to make! Great tips. This spinach casserole must taste wonmderful.